New Excavation At Pompeii Uncovers Victim Crushed By Massive Rock : The Two-Way The adult male survived the initial eruption but was, like many victims, caught in the subsequent cloud of gases and rocks. Unlike most victims, he was also pinned down by a "formidable stone block." 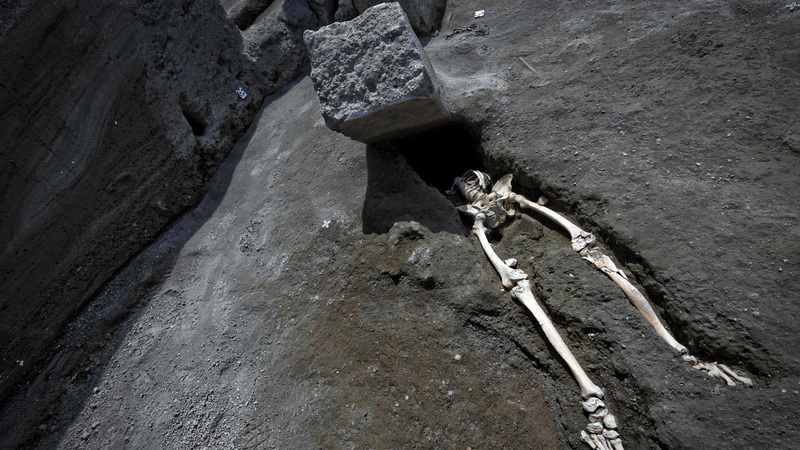 The legs of a skeleton emerge from the ground beneath a large rock, believed to have crushed the victim during the eruption of Mount Vesuvius in A.D. 79. The skeleton was found at Pompeii's archaeological site, near Naples, Italy, and was announced on Tuesday. "Initial observations would appear to indicate that the individual survived the first eruptive phase of the volcano, and subsequently sought salvation along the alley now covered in a thick layer of lapilli," or rocks ejected by the volcano, the site said in a statement released Tuesday. The man was on top of the layer of rocks, which was a full story high by that point. The dense cloud of gas and stone, called a pyroclastic flow, knocked him backward, the archaeologists say. "A formidable stone block (perhaps a door jamb), violently thrown by the volcanic cloud, collided with his upper body, crushing the highest part of the thorax," they explain. The skeleton's head has not been located, but archaeologists believe it is probably crushed beneath the stone block. The man was an adult, over 30 years old, who had a bone infection that would have caused him to have trouble walking and may have interfered with his escape, archaeologists say. Of course, plenty of able-bodied adults were equally caught up in the volcano's deadly cloud. The massive explosion of Vesuvius, which destroyed Pompeii and Herculaneum, is one of history's best-known natural disasters. The human toll was detailed by Pliny the Younger, who described an apocalyptic scene of profound tragedy, and preserved physically in the bodies of the many victims entombed by the ash — including desperate would-be evacuees clinging to their belongings and families trying to find shelter together. New excavations at the Pompeii site began in March, in a section called "Regio V," which has been largely unexcavated and hasn't been researched since the postwar era. The unlucky man is the first victim of Vesuvius found in the new excavation. Earlier this month, researchers at Pompeii announced another new discovery at a separate site, just north of the walls around Pompeii, in the Civita Giuliana. The team had found illegal tunnels dug by illicit treasure seekers and began excavating the area to protect the artifacts there. As a result they found kitchen utensils, part of a bed and a tomb that was created after the eruption. A restorer works on the mold of a horse in the ruins of a Roman villa recently found by Italian carabinieri (police) during an investigation into tunnels dug by thieves in Civita Giuliana, next to the archaeological site of Pompeii. 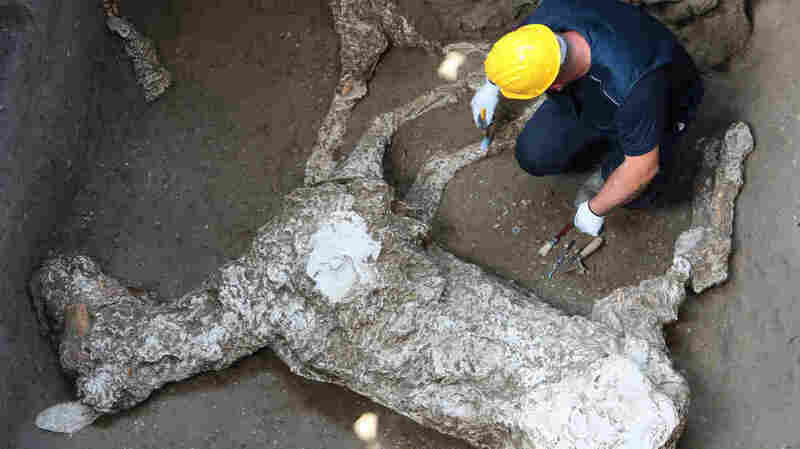 They also managed, for the first time, to make a cast of the complete body of a horse that was killed in the eruption. "From the remains of its skeleton, they believe the horse was an adult measuring around 150 centimetres [4.9 feet] tall at the withers: on the short side by today's standards, but given that horses were probably smaller at the time, the experts say it would have been exceptionally large for its time. "That, along with the fact that traces of a harness in valuable iron and bronze were found by its head, suggests that the animal was a specially bred parade horse, probably of considerable value." The horse died during the eruption, and its body was surrounded by volcanic ash. After the ash hardened the corpse decayed and left behind a horse-shape cavity. Archaeologists have previously made plaster casts of human victims, as well as a pig and a dog, The Local writes, but this was the first complete horse cast. Two other horses' remains were found nearby, but they were less complete, National Geographic reports. The magazine also says that bits and bridles around the horses' bodies suggest they may have been harnessed by people unsuccessfully attempting to flee the eruption. A previous photo credit misspelled the name Kontrolab as Kongrolab.